Note: I am not an expert in this topic. In fact, I have no idea what I’m doing. I am live blogging my live learning on this topic. Why does my classroom exist? Why do I go there every day? What do I hope to achieve each day, week, month, year? Why should my students show up, what should they expect, what will they leave with? Unfortunately, I can’t answer these questions in 25 words or less. That’s why I need a mission statement. Google tells me that a Mission Statement is “a formal summary of the aims and values of a company, organization, or individual.” Yawn. Mission Statements are often used in the world of business, so let’s take an example from there. That’s a pretty great mission statement. Every decision made at Patagonia (theoretically at least) can, and should, be run through the lens of this mission statement. What clarity of thought this must create. For the budding coders among us. 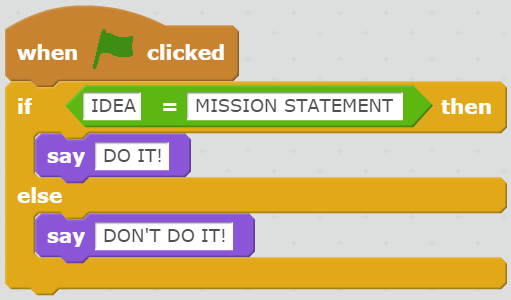 If I had a mission statement I could run every action through my handy code above. How easy would life be then!? So I definitely need a Mission Statement. How am I going to write one? No time for that. Instead, I’ll turn to google to brainstorm for me. Google Search: Classroom Mission Statements. Step 2. Answer these 4 questions. I should probably consider this for a few days, but let’s do it in ten seconds instead. What do we do? Provide opportunities to succeed and develop a love of learning. How do we do it? By leveraging technology to personalise the learning journey. Whom do we do it for? Always for the students. What value are we bringing? An ever-growing knowledge of pedagogy, content and technology. Not terrible, but I’ll come back to it later. My classroom mission is to foster a love of learning through success in mathematics. Each student is treated as an individual and given every opportunity at mastery. We are constantly evolving our practise to leverage the latest in research and technology. But I’ll keep working on it. Do you have a classroom mission statement?